Here’s another update from SMBAS Blog on that large, disc-like, shining object which has frequently and mysteriously appeared in our nighttime sky this year (some call it the moon). Aug. 18, 2:26 a.m. PDT — Full Sturgeon Moon, when this large fish of the Great Lakes and other major bodies of water, such as Lake Champlain, is most readily caught. Other variations include the Green Corn Moon or Grain Moon. No supermoon this year: the moon arrives at perigee — its closest approach to Earth — on Aug. 22, 9:22 AM PDT. Sturgeon, by the way, are very ancient and very cool fish. 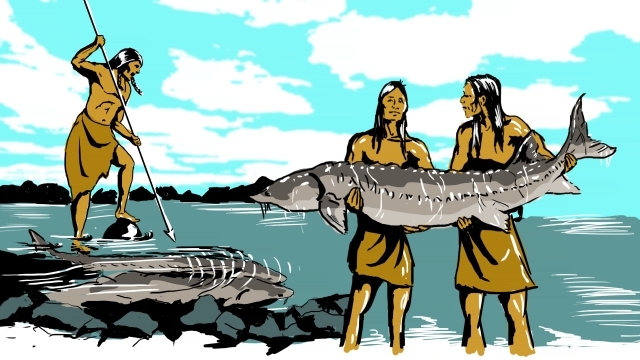 Hiawatha, that pestiferous egomaniac, called him the “King of Fishes,” but his treatment of Nahma the sturgeon was unsuitably disloyal. The annual performance of the Perseid meteor shower was on the 12th-13th, but you probably missed it. Speaking of moons, you must certainly know that Jupiter has a new man-made moon, Juno. Appropriately named for the wife of Jupiter, king of the Roman pantheon of gods (Hera and Zeus are the equivalent Greek goddess and god), Juno will make it’s first close pass around Jupiter on August 27. The successful orbit insertion on July 4 sent it into the first of two planned 53-day-long loops around Jupiter, but on this close loop around the gas giant, it will have all instruments turned on as it passes more closely than human instruments have ever been. Juno will loop down over the planet’s north pole and back up over the south pole, entering and exiting through the “doughnut hole” of Jupiter’s enormous magnetic field, 20,000 times stronger than the earth’s. Scientists hope that the 1-cm-thick casing of titanium will protect the electronics from the field’s radiation, which over the 14-month course of the mission is estimated to be equivalent to 20 million dental X-rays, but they won’t know until after this pass the accuracy of their calculations. The whole thing may get fried. The Old Farmer’s Almanac has a page for each full moon. One tip for September: Best days for harvesting belowground crops are 19th, 20th. 28th or 29th. Now you know, so you have no excuse. The next significant full moon will occur on Sept. 16, 12:05 p.m. PDT. Keep an eye on this spot for additional late-breaking news on this unprecedented event. written by Joe Rao. Joe Rao serves as an instructor and guest lecturer at New York’s Hayden Planetarium. He writes about astronomy for Natural History magazine, the Farmer’s Almanac and other publications, and he is also an on-camera meteorologist for News 12, Westchester, N.Y.